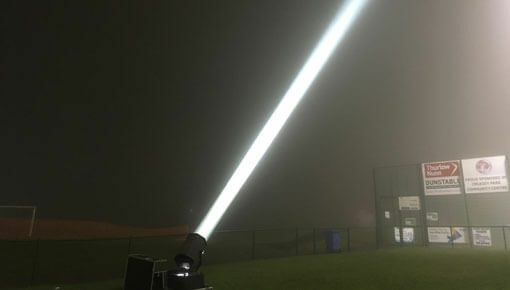 We offer a range of products which are suitable for all types of outdoor events, so whether you are want to draw attention to your event or brighten up the entrance, we have a wide range of sky beams visible from up to 5 miles away. Our products are available for both hire and purchase and can be shipped anywhere in the UK or Europe. The prices displayed on our site include delivery and collection charges to any UK mainland address via courier. As the delivery is not carried out by ourself we can not allocate a specific delivery time. We can offer a pre 12 pm service at an additional cost. The lights can be collected and returned directly from our warehouse located in Hatfield, Hertfordshire at a discounted rate or for larger orders of 3 or more lights we can arrange delivery ourselves. Unfortunately it’s not possible to project an image or logo into the sky. Any projection needs to take place onto a fixed surface, so it can be done on the side of a building for example but not directly in the sky. So if you’re looking to recreate a scene from Batman, then I’m afraid you’re out of luck. Our searchlight hire range includes simple but effective plug and play units, we also have units available with DMX capabilities if you want more control. 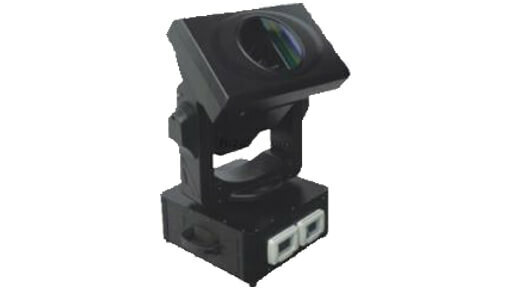 Choose from a variety of multi-beam or single beam search lights, with various power supply requirements. We also have multicolour 7Kw units to add an extra special effect to your event. We pride ourselves on excellent customer service and can normally hire at short notice. Available in two different brightnesses, the sky scanner is a simple plug and play model. It can rotate automatically (pan across the sky, 90 degrees)in the horizontal plain. The angle of the head can be adjusted manually. 2KW offers an excellent brightness yet can still be plugged into a standard 13amp plug socket! 5KW is brighter than the 2KW and can be seen from further away. It therefore requires more power, a 32amp single phase supply. Prices start from £336 incl. VAT and transport. The DMX unit provide a greater level of control for the operator and the light offers a much wider range of movement. 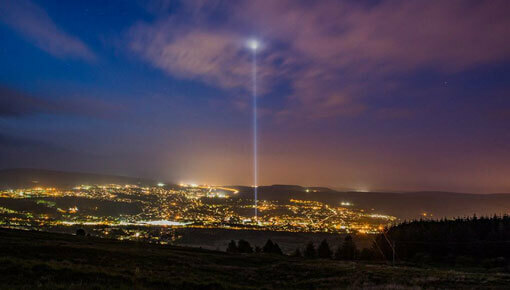 The beam can scan around 360 degrees horizontally and 270 degrees vertically. 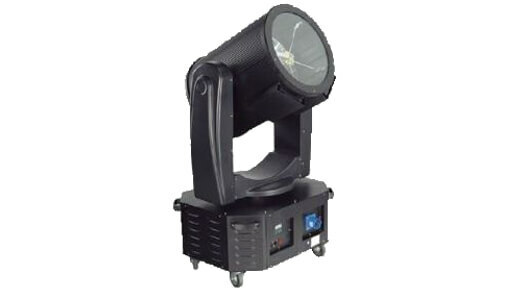 The light can be controlled manually or be programmed via DMX and a lighting desk, alternatively there are some pre-programmed settings where the lights will move through a specific sequence for simple use. Prices start from £426 incl. VAT and transport. 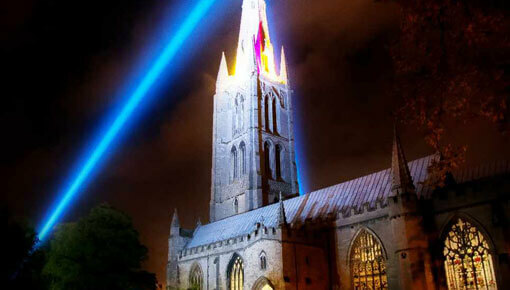 Coloured beams are only available in the 7KW range. 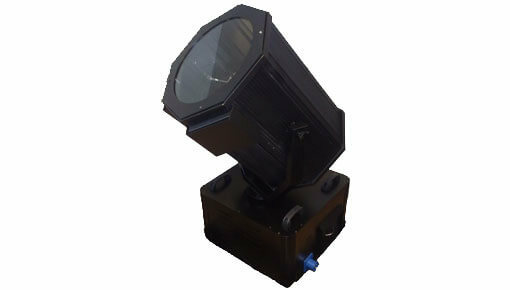 The lights share all the functionality of the 5KW DMX, the beam can scan around 360 degrees horizontally and 270 degrees vertically and is fully controllable. The colour is changed by a set of lenses which slide in front of the beam of light. These are also controlled by DMX. Prices start from £570 incl. VAT and transport. All our products, new and used are available for purchase. Please contact us for up to date purchase prices. We can arrange delivery / collection for the day of your event or one day either side, which gives you the chance to set the light up and have a practice. All our lights are delivered in a flightcase, on wheels are pictured right. – Courier Service (TNT) will deliver direct to your door. For standard delivery we can not provide a specific delivery time, only a window between 09:00 – 17:00. For an extra charge of £30 ​per unit we can request a morning slot for delivery before mid-day. The collection timings are more flexible. – Personal Collection from our warehouse in Hatfield, Herts AL10 9BB. If you have your own van and want to collect and return a light yourself then we will reduce the cost of your hire (by circa £120). Please check the dimensions and weights before booking as the lights are very large. We have a ramp but you will also need to consider getting the light in and out of the van as they weigh in the region of 100kg’s each. – Dedicated Delivery can be arranged by ourselves, this is usually beneficial for local and/or larger deliveries (3 or more lights). When delivering ourselves we can be more flexible with providing a specific delivery time.